Jack Vettriano produced the drawing of the Beautiful Dreamer on A6 card. Renowned artist Jack Vettriano has donated a rare drawing to help raise funds to keep one of Wales' oldest art galleries open. The drawing, called Beautiful Dreamer, is one of 11 works by selected artists being auctioned at the Oriel Plas Glyn-y-Weddw gallery, in Pwllheli, Gwynedd. It costs £200,000 a year to run and the Arts Council for Wales is only able to give £15,000 towards it this year. The drawing is the only one Vettriano has ever submitted for public display. The artist, best known for his painting The Singing Butler, said: "I first heard of the Oriel Plas Glyn-y-Weddw gallery when a friend and collector of my work asked me if I would contribute something to their fundraising event. "I do get many requests to help many different causes but I thought the gallery looked magnificent and was sorry to hear that Wales' oldest gallery gets overlooked for funding. "The brief was to produce something on an A6 card so I decided to try something very different for them; an intimate little drawing that I thought would work on a small scale." Vettriano, thought to be one of the most commercially successful living artists, said: "I rarely draw, preferring as I do to work directly on to canvas when I've worked out an idea for a painting. 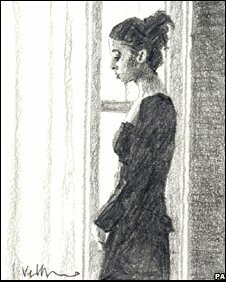 "The drawing I've done, Beautiful Dreamer, relates to a painting of the same title and features a woman standing in front of the window in my studio in London. "I wanted to keep the drawing really simple and I hope it works - it's the only drawing that I've ever put forward for public display." The Scotsman added: "I hope someone likes it and that it helps to raise some decent funds at next Saturday's event." The gallery is housed in an historic Victorian Gothic mansion and is run by a charitable trust. Gwyn Jones, the gallery's director, said he felt "humbled" by the response to the auction from artists and celebrities who also include William Selwyn, Gareth Parry, Keith Bowen and Bryn Terfel. "It's phenomenal to have a drawing from Jack Vettriano who has never given anybody a drawing before," he said. "We've already had substantial interest with people wanting to place phone bids. The reserve is £5,000 and we're hoping it will make £10,000." The auction will take place at the gallery on the opening night of their Cerdlun exhibition at 1930 BST on Saturday, 26 July. Phone bids will be accepted as the opening night is already a sell-out with with over 200 tickets sold. Vettriano was awarded an OBE in 1993 for his services to the visual arts and in less than 15 years the value of his work has seen a huge increase. The Singing Butler sold for £744,800 setting a record for a Scottish painting.